These DLC lens caps have several important advantages over the regular snap-on cap. They have no ears to accidentally knock the lens cap off. They can be squeezed from the outside or using the inner recessed opening. 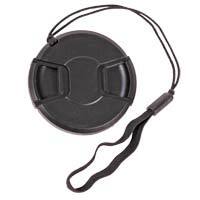 In addition, they have a built-in lens cap leash to help prevent loss. Size is 58mm.